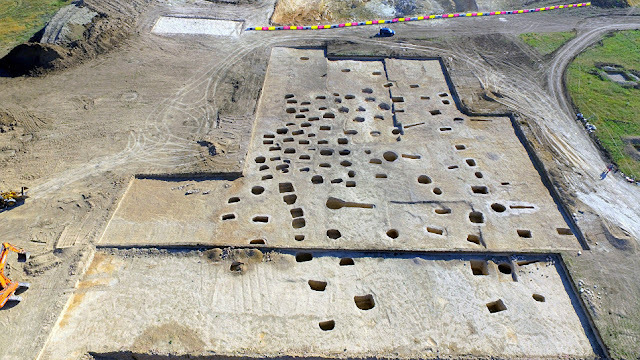 The Crimean expedition headed by the Institute of Archaeology of the Russian Academy of Sciences has discovered an intact late Scythian necropolis containing more than a hundred graves and yielding about 1.3 million artefacts during excavations at the construction site of the future highway 'Tavrida' near Sevastopol. In ancient written sources there is very little information about the past of the Crimea (or Tauris), and its history in late antiquity is full of blank spots. Therefore, archaeological excavations are of particular importance. The necropolis is situated on the left bank of the river Belbek Novostroika and dates from the second to the fourth centuries AD. The population of the Western Crimea in the Roman period was very heterogeneous. Greeks lived in Chersonesos, the native Tauri people occupied the surrounding mountains, and the Scythians settled in the steppes of the North-Western part of the Peninsula, having migrated from the Northern Black Sea coast. "Now it is hard to say who the people buried in the necropolis were. The Belbek river valley, where the graves were found, was a contact zone of many peoples in late antiquity: the descendants of Taurians, steppe cultures (late Scythians, then Sarmatians), Gothic Germans, all of which were strongly influenced by the Greek Chersonesos.The local culture was largely eclectic, as evidenced by the finds from the burial ground. The methods of burial and the artefacts found in them indicate different cultural influences. 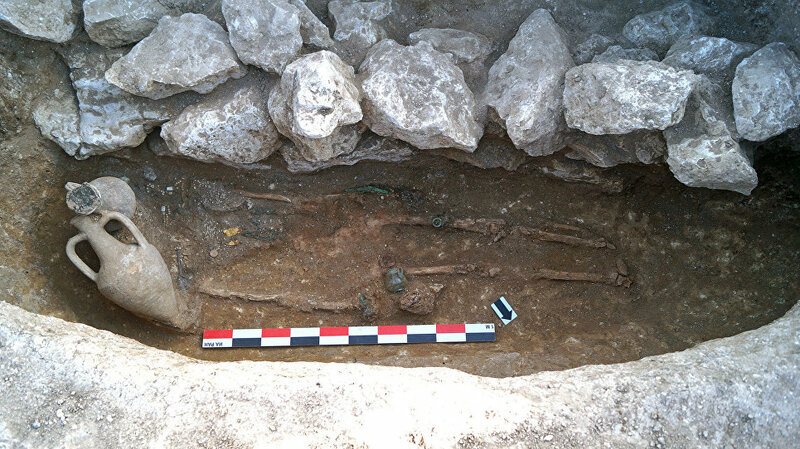 Clearly, the burials reflect the turbulent historical events of this period," noted the Russian archaeologists. The earliest burial of the necropolis dates from the end of second or the first half of the 3rd century AD. Most are inhumation burials, some of which consist of a vertical corridor leading to underground burial niches arranged along one of the walls of the tomb. The deceased were laid on their backs, with bowls, glass vessels, knives placed at the heads, along with offerings of food. The entrances of the burial chambers were sealed with stones. Female burials are clearly differentiated from the male burials by the jewellery they contain - beads, bracelets, rings, earrings - as well as glass bottles and spindle whorls, but no weapons. Male burials, on the other hand, occasionally contain large signet rings and single large beads, and are typically accompanied by weapons (swords, daggers, shields) and horse bridles. In one of the burials archaeologists discovered a pitcher, a glass incense bottle, amphorae, a knife, a glass necklace, several amber beads, and three golden laurel leaves (probably from the Greek golden funeral wreath) placed near the head of the deceased. Also in the burial several glass beads that once adorned embroidered clothing were discovered, as well as two fibulae and two belt buckles. Among the many finds in the earlier burials is a signet ring with a cornelian insert and a gold chain with a tear-shaped pendant, also with a carnelian insert. The closest analogues were found in the necropolis of Chersonesos. Excavation revealed that the necropolis gradually expanded to the south and east. Most of the graves of the second half of the third and the beginning of the fourth century AD were also inhumation burials, including simple pit graves lined by large stones. In the 4th century underground crypts were built, consisting of rectangular underground burial chamber accessed by a narrow corridor-dromos with steps. The entrance to the chamber was blocked with a large stone. Several people were buried in these vaults, apparently members of the same family. 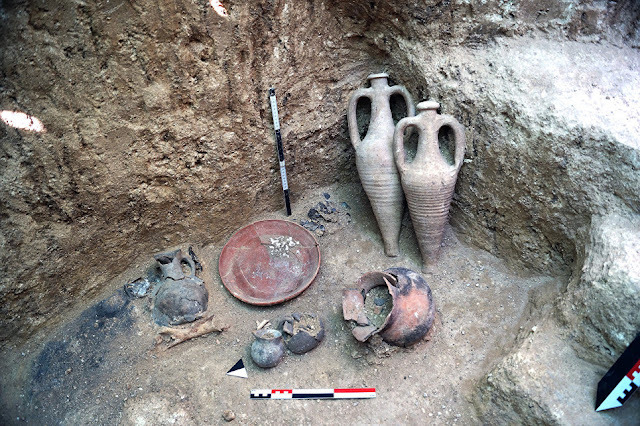 During the excavations Greek red-and-white dishes, glass jars, and a myriad of buckles and fibulae were found, which researchers attribute to Chernyakhov culture of the second-fourth centuries. Indeed, the collection of fibulae from the excavations is particularly impressive in terms of the number of specimens and different types found. At present excavations in the southeastern section are being completed and will then move to the north-west, where there may be earlier burials. After the completion of the work, the site will be handed over to the builders, and the materials of the excavation will be transferred to the Chersonesos Museum-Reserve in Sevastopol.